Hey all, yes I know, I’ve been away far too long. Apologies for that. Hopefully this new article will jump start a better schedule of updates from me. 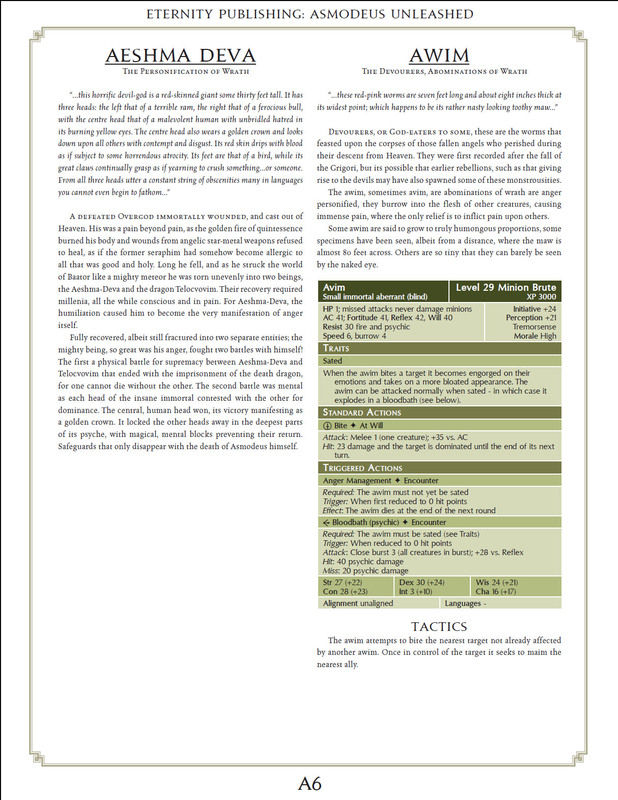 As well as speed up the releases (and rereleases) of the Vampire Bestiary. Since I haven’t had a new update in a while I decided to make this article, which is basically the final form of Asmodeus into its own article rather than simply tack it on to the end of the previous Asmodeus Unleashed article. I still don’t think its a patch on the Orcus, Kronos or Asmodeus monsters I have posted on these forums. But I have made some significant changes to Aeshma-Deva and its far better than the original posted last week. Still not satisfied with it but I’ll wait to hear what the rest of you think. I did some substantial brainstorming last night and I think I have come up with a much better design for Aeshma-Deva- I’ll work on those ideas for a day or two (working the next few nights) and then update the whole article sometime this week. Looks interesting, but since your going to revamp it anyway I am not going to comment on to much at this time. One odd thing I noticed is that the standard action recharge power “Mouth of Hell” does the same damage as the at-will minor power “Grab and Bite.” I think you might want to up the punch on “Mouth of Hell” I look forward to the updates! I should have that update tomorrow (Sunday) and I also have the next article finished (on paper – just need to type it up) and that will be online the following Sunday. I’ll try and stick to an update every 2 weeks – I am sure I won’t be able to but hopefully that will be enough to keep the updates quicker than usual. Just one comment for now, this critter doesnt seem to me to have quite the same terrifying appeal the other two forms did. Also, I think the fall from grace might be a little *too* powerful. means if a player is below half health they die from the one attack. Well remember of course that epic tier characters (especially those at 30th level) will be able to come back from death and probably have various resistances as well. 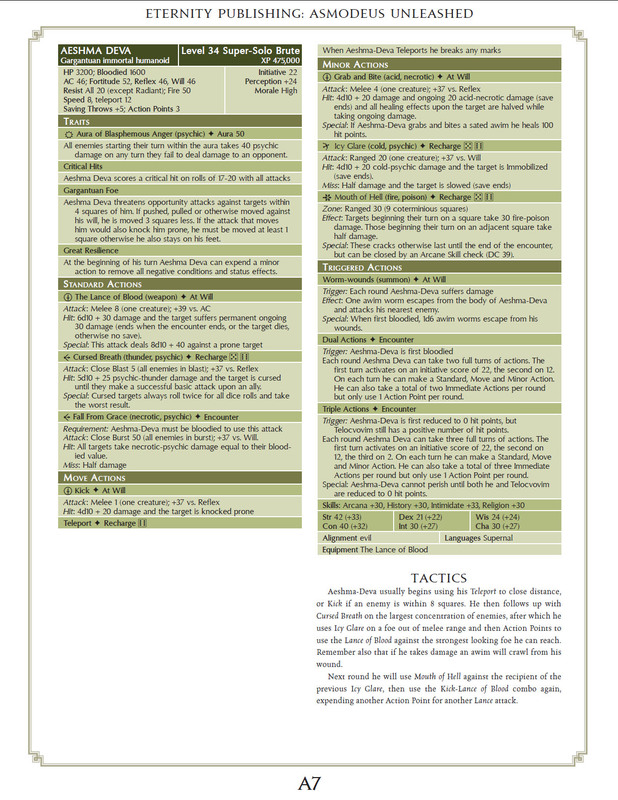 In pure damage terms I worked out that the attack should deal 12d10 + 60 damage, so I probably weakened it by making it only deal damage equal to bloodied value. I have had problems with the design of Aeshma-Deva from the start and for whatever reason I just ‘can’t get a handle on it’ at all. There’s just something about it I am having problems with. Normally I can immediately see some design ‘hooks’ and then with some brainstorming I come up with a great monster but this one just has me flummoxed. I sort of envisioned him more like the Hulk (as in the personification of anger) crossed with what we know from myth about Aeshma-Deva (his physical form with the three heads, carries the spear/banner, wears the crown, rides the dragon and breathes fire). But somewhere along the line it just didn’t all come together. I can understand. You are starting with an avatar that intentionally shows itself as being truly terrifying in its powers, and uses appropriate evil themed abilities, but then going to a semi-divine being, that while truly powerful, may not have the same innate abilities of true terror, just sheer power level. So while it may be harder to defeat, it may not seem as terrifying flavor wise. I might suggest just having one or two of its at wills be akin to its true powerful divine nature, and for the rest of it say screw the lore and canon and just make more powerful versions of the fun previous abilities. Aeshma-Deva should simply be a monster devoid of reason, existing on pure anger alone. 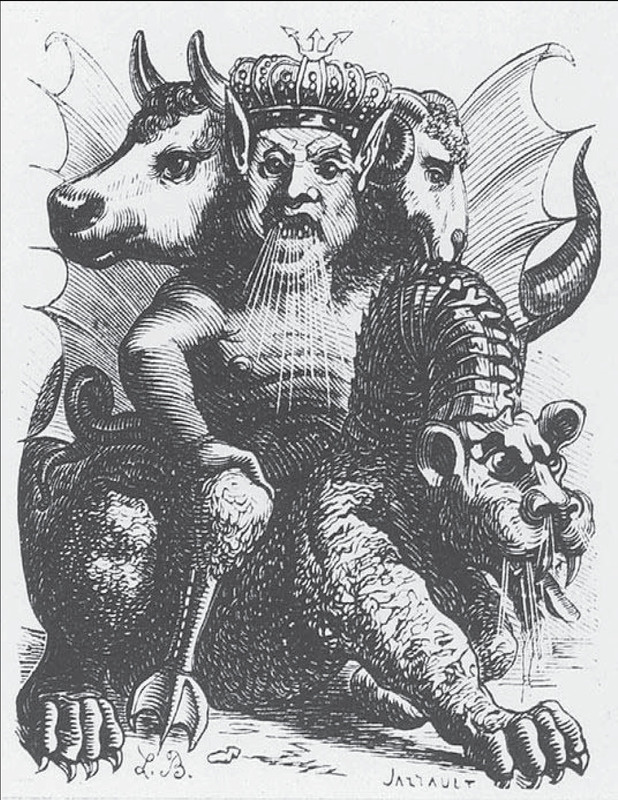 Asmodeus is more of a cold, calculating manipulator compared to the ‘Mad Bull’ that is Aeshma-Deva. Not sure exactly how much of the ‘Mad Bull’ I captured in the design though. The Avatar of Kali in the Temple of Death pdf is sort of similar in theme (Angry God) but I think her design is much more interesting and I didn’t want to repeat or copy those design elements for Aeshma-Deva. although I am still unhappy with how it turned out. Its just missing my usual ‘je ne sais quoi’.